Man oh Man do I love a good berry pie. In the years of the blog I’ve enjoyed so many different varieties, but any new flavor combo has me excited for even more. I’ve made Classic Blackberry Pie, Raspberry Buttermilk Crumb Pie, Mixed Berry Pie, Strawberry Rhubarb Pie, Berry Rhubarb Crumb Pie and more. 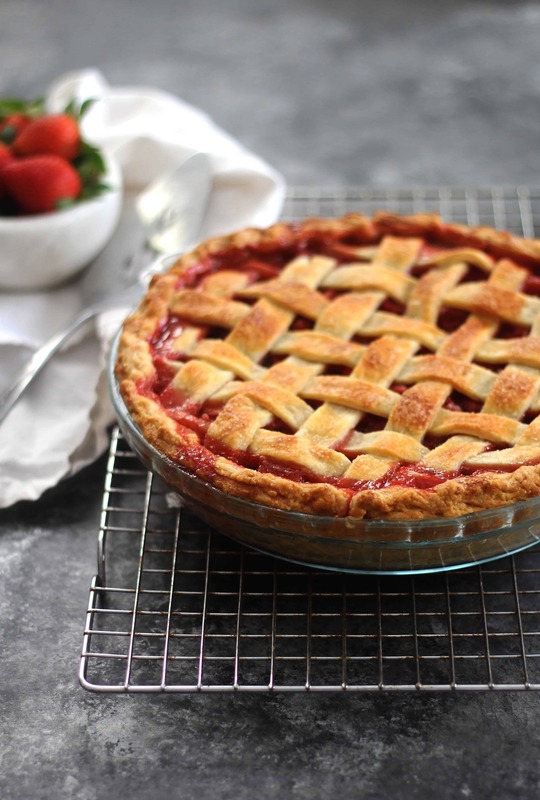 Yup, I’m obsessed with the juicy, sweet and sometimes tart berry filling paired with a buttery, flaky crust. It’s one of my top 5 favorite desserts of all time and I’m here today with one for ya. Pairing the sweet strawberries with tangy balsamic vinaigrette is pretty wonderful. It’s subtle in the final flavor, but enough to cut the sweetness and add a touch of savory to this otherwise very sweet dessert. I’m grateful to my friend Joanne for first posting about this recipe, giving me a one track mind until I had a chance to make it. The original recipe for this beauty comes from Four and Twenty Blackbirds, a wonderful pie shop in Brooklyn that I used to get to enjoy back in the day. I didn’t follow it exactly, partly because of what I had on hand and partly because of my own pie-making experience but it was pretty darn amazing either way. When it comes to thickening berry pies- I’m an instant tapioca girl. I really believe nothing works better. I love a juicy pie, but not a soupy one and tapioca really is the best. If you really don’t believe me, Joanne used cornstarch and hers turned out well so you can always try that too. Happy Spring- now go make this lovely pie! While your pie crust is chilling, prepare the filling. In a large bowl sprinkle the strawberries with the 3 tablespoons of sugar and toss gently. Let sit for about 20 minutes and then stir in the apple, balsamic, brown sugar, tapioca, pepper & salt. Toss to combine and allow flavors to sit and get juicy. Once chilled, roll out one of the pie crusts and drape it over the bottom of your pie dish. Pop it in the freezer for a few minutes while you prepare the second crust. Roll that one out as well. 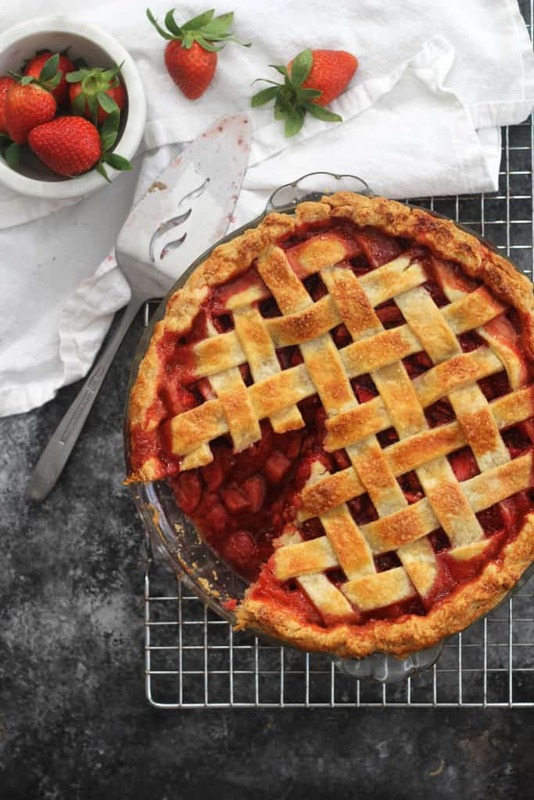 If you want to try a lattice crust, use a straight edge to cut your strips. Pour the filling into the chilled crust and add the top crust. Trim and crimp the edges of the crust and pop it in the fridge or freezer while your oven preheats to 425F. When oven is ready, brush the crust with the egg wash and sprinkle with sugar. Line a cookie sheet with foil and place the pie on top. Place in a middle rack. Bake for 20-25 minutes or until the crust is beginning to turn golden and then reduce heat to 375F and bake for another 35/40 minutes or until the crust is golden brown and the pie is juciy and bubbly. Recipe adapted from Four and Twenty Blackbirds. Note on the pie crust: Per the recipe's instructions I added ¼ cup cider vinegar to my ice water that I added into the crust. I think it made the crust extra flaky! Looks delicious!! Do you think this flavor combo would work with some rhubarb thrown in? Balsamic is good with anything, so…. Yes! Just maybe add a little more sugar! So glad you posted this! I just baked the recipe as is a few weeks ago using the arrowroot. I waited for it to cool completely, and I cut into it and just had a puddle. It did not set at all. I was so frustrated. So I’m def going to try using your instant tapioca! 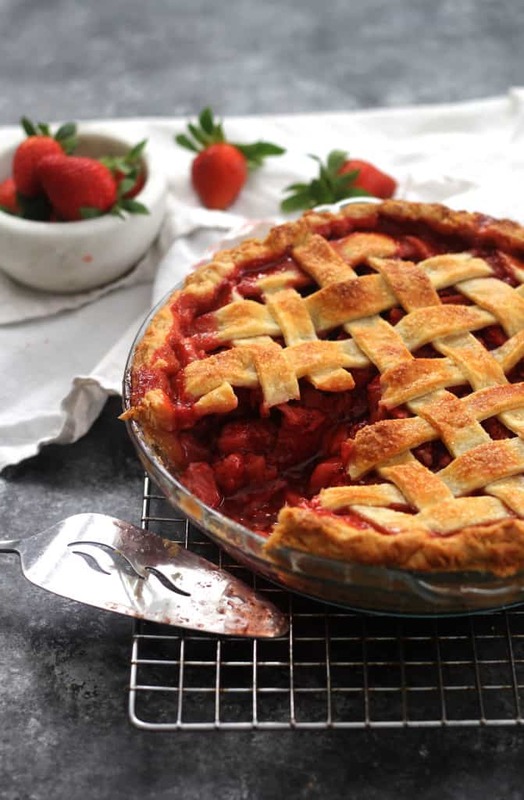 I wondered too about leaving behind all the juice from the filling in the bowl and just adding the strawberries into the pie Crust. What are your thoughts on that? Is it necessary m? Wasting that juice seemed like such a shame so I didn’t do it! With the instant tapioca there was no soupiness!